This is an example of the "Theatre of the Mind" material that was once such a compelling part of radio. It made you stop, it made you listen and most important, kept you tuned in. Hear Dan Neaverth and long-time sidekick Artie here. Christmas was always a special time during Top 40 radio's golden years, with seasonal shows and programming to celebrate the holiday. In southern Ontario/western New York, we recall Toronto's CHUM-FM playing Beatles music every Christmas morning back in the early '70s. It wasn't Christmas music, but somehow it seemed to fit. In the '80s, there was Wes Atkinson and his wife Carol with their annual Christmas show at FM 108 in Burlington, Ontario. 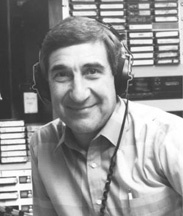 Stan Roberts did a Christmas morning show for years on Buffalo's WGR. 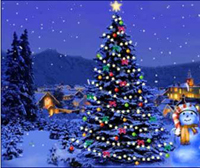 And Roger Ashby devoted his Sunday Morning Oldies Show to the Christmas theme, on the Sunday preceding Christmas. For years, Canadian FM radio legend Dave Marsden has done his own annual Christmas show, most recently on The Rock in Oshawa, Ontario. We also cannot forget the great Christmas charities, such as the CP24 CHUM Christmas Wish, whose roots go back to 1966. Please give if you can. Buffalo legend Hound Dog Lorenz got in on the Christmas act, too. His "Cool Yule" show was a Christmas staple on his own station, WBLK-FM. Hear the Hound's "Cool Yule" from Christmas 1968 here. Long-time Buffalo morning man Stan Roberts gave us many reasons to smile over the years with his cornball sense of humour. But there was a warmth to his presentation that went far beyond the jokes. He really seemed to care about the listener, and to many he was a special friend on the airwaves. When he said he "treasured" being on the air (as he does on this aircheck), you knew it to be true. Roberts especially shone during his annual Christmas morning show, which aired during his tenure at WGR from 1972 to 1981. Roberts took calls from listeners (many of them kids), played some great holiday music, and tied it all together with his wonderful on-air style. It was personality radio at its finest. Enjoy the Stan Roberts Christmas show from 1973 here. Don Berns tells Rock Radio Scrapbook he got in trouble with this bit in Dallas - seems you can't make fun of drunk people there. Buffalo seemed to be cool with it, however. Hear Don Berns with The Night Before the Morning After on WYSL here. "This is Raccoon - the Red-Nosed Rodent!" It's Christmas Eve 1976, Raccoon Carney is sending you the loudest Christmas wishes you ever heard. Why isn't radio this exciting anymore? Station: FM 108 (CING-FM) Burlington, Ont. On a pioneering radio station, Ralf and Dave were pioneers. "Dave and I worked at FM 108 for 5 years beginning in 1980. We started out doing the midnight to six shift and continued on with that for a couple of years. In the latter stages of 1983, we scaled back to midnight to three. Shortly thereafter we changed our name to "The School Of Rock n Roll". Our big thing for most of the years was doing what we called the "Record Roll-Out". These were 3 hour marathon sessions where we essentially played Name That Tune complete with Platter Pack prizes, concert and food giveaways etc. etc. I remember we had quite a following and had to bring in outside help to man the phones. Sometime in 1984 (I believe) we got a Thursday evening time slot (either 8:00 or 9:00 pm) where we ran weekly features that were theme based; e.g. "Rock N Roll Upstarts", "Group Soundalikes", "The Worst Songs To Ever Chart" (we actually broke the records on air after playing them for that show---caused quite a stir!! :<))...also did specials on particular artists like The Teenagers, Freddy Cannon, The Platters etc. Our affiliation with FM 108 gave us unlimited access to Lulu's in Kitchener where we spent 3-4 nights per week interviewing artists and subsequently using bits of these interviews in our shows. What else? Dave and I did two specials every year--one was the "Back To School" special---always on Labour Day (Dave and I were both teachers). And we always did a Christmas special (sometimes in the form of a Record Roll Out). It was interesting in that regular programming was preempted to make room for these specials. And of course we created the Doo Wop Shop which was very successful and had a strong following. Dave and I also regularly filled in on Saturdays etc. when people like Burt and Robin were unavailable. I'm sure I've left many things out, but you get the general idea...we were VERY involved with the station for those 5 years." Enjoy Ralf and Dave with their 1983 Christmas show (UNSCOPED) here. Enjoy Ralf and Dave with their 1983 Christmas show (SCOPED) here. 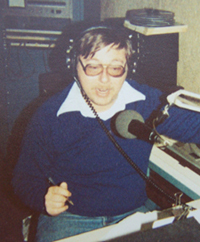 Reid's annual Christmas show was tremendously popular during his years at CJAD, and continues to be the station's most requested program years after his passing in 1983. A native of Cobourg, Ontario, one of 16 children, Reid got his radio start in 1947 at CHEX Peterborough. In 1954 he moved to CHML Hamilton where he hosted several shows including Nightcap, where he began his long-standing practice of reading poetry on the air. Reid moved to Montreal's CJAD in 1964, hosting Paul Reid's Wonderful World of Music. It was a five-hour show that included interviews with folks from all walks of life, and three hours of music programmed by Reid himself. It was during his time at CJAD that he started began the Paul Reid Christmas Show and recorded his first album of poetry, A Letter To My Love, in 1968. Reid gave the show away to anyone who wanted it - it even aired on Armed Forces Radio Vietnam. 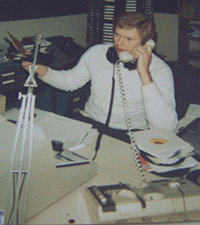 Reid returned to CHML in 1977, then bounced back to Montreal at CFQR three years later. In failing health, it was arranged for him to broadcast his show from his bedroom until his death in January 1983. His posthumous induction into the Canadian Association of Broadcasters Hall of Fame came in November 2007, a month before this show aired. Enjoy the Paul Reid Christmas Show on CJAD (UNSCOPED) here. Every year in mid-November, numerous radio stations go to an all-Christmas format, a ploy that never fails to get great ratings. Problem is, most of these stations rotate the same 300 or so songs ad nauseum, neglecting the thousands of great Christmas songs that have been recorded over the decades. It gets boring real fast. Sam Ward takes an opposite tack in his 2011 "An Old-Fashioned Christmas" show which aired on the now-defunct audioldies.net. Sam plays a wide variety of rarely-played Yuletide favourites from the first half of the 20th century and even some from as far back as 1898 - the very dawn of recorded music. You won't believe what he's found!